We started out the day with our faithful oatmeal (ermagherd, I love Justin’s oatmeal) and black coffee. I headed out to teach the PE class I’m covering until June (hooping and yoga, whaaaaat? ), came home to take care of some work, then we set out for falafel times. 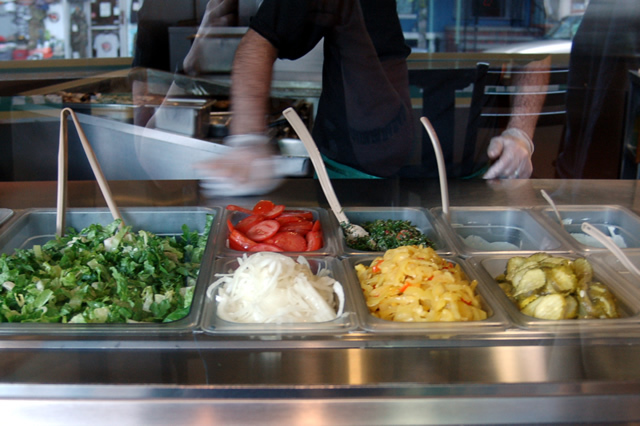 Delicious falafel times. The coolest thing about this falafel place is that it really is a local mom & pop place. Most everybody there appears to be either an immigrant or a first-generation American. 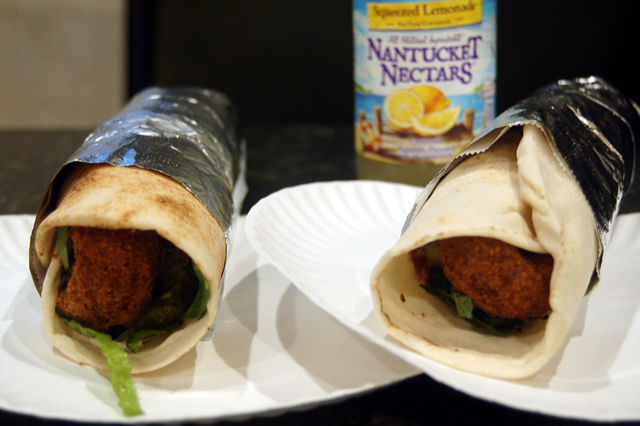 When, once, I asked if they made their falafel in-house, one of the guys showed me the dough, and then we agreed that one day we’d have a “falafel-off” since my homemade falafel is so different than theirs (which is also very good). He said in his home country (Syria), they make the falafel very green with parsley like I do, and that he’d like to try it. Today, when we went in, though, I didn’t even have to give a full order. 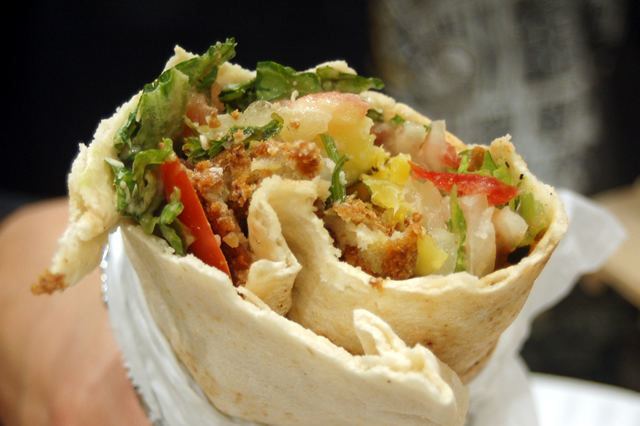 I ordered our usual “two falafel wraps with everything…” and before I could continue, the guy responded with “…no dairy.” I confirmed, “for here, and with a lemonade.” Best townie food, 4 evah. My only complaint (and it isn’t one, really) is that there should be a cold water container available to split the lemonade and water it down. It’s very sweet, and I sometimes forget to bring my water bottle (not just sometimes, I guess, because I always think this and wonder, “why isn’t there a water station here?”). Anyway, falafel is delicious and all, but last night, our landlord dropped in to give us 1.5lbs of French leeks that he grew in his garden a couple streets over. He suggested wilting them and eating them straight-up with salt and pepper. He said to me in his best English, “eh mehbe e two weeksh — moahr.” He’s pretty great. He clearly appreciates that we pay the rent on time. It’s cool and rainy today, the way it has been for the last several weeks (aside from one glorious day last weekend). 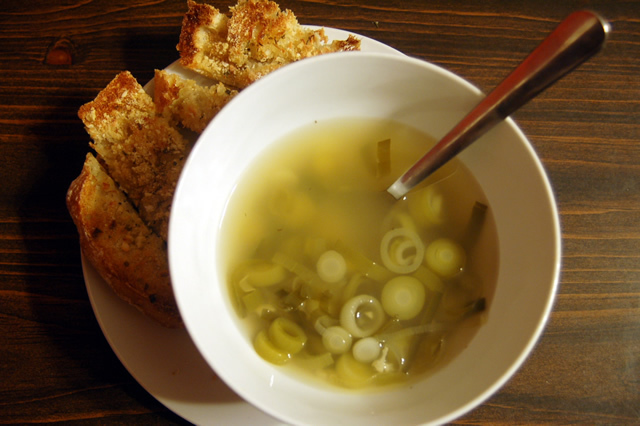 On days like this, I just crave all these very hot watery things: coffee, tea, broth-based soup. And look at that: we have fresh leeks and water, all the makings for a good broth soup. Paired with Devil Breath Garlic Bread, we should find ourselves satisfied and alone for several more days. 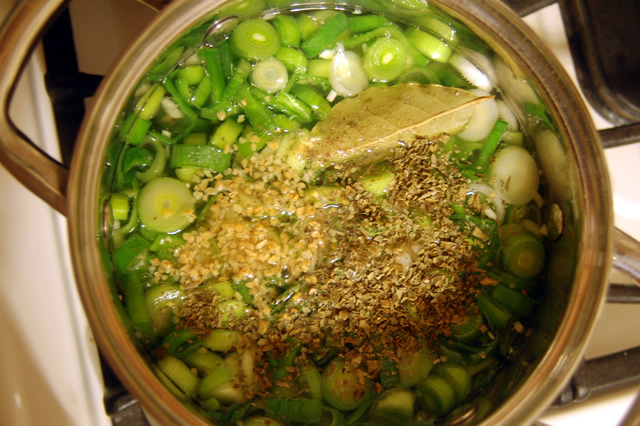 Bring to a boil, then simmer until the leeks are soft and you’re ready to eat it. Serve with Devil Breath Garlic Bread. I didn’t realize there was, but my landlord was insistent on telling me that they were French.